For successor (by-pass) bridge (to the S), see NN70SE 197. Dunblane Bridge, from 1409. 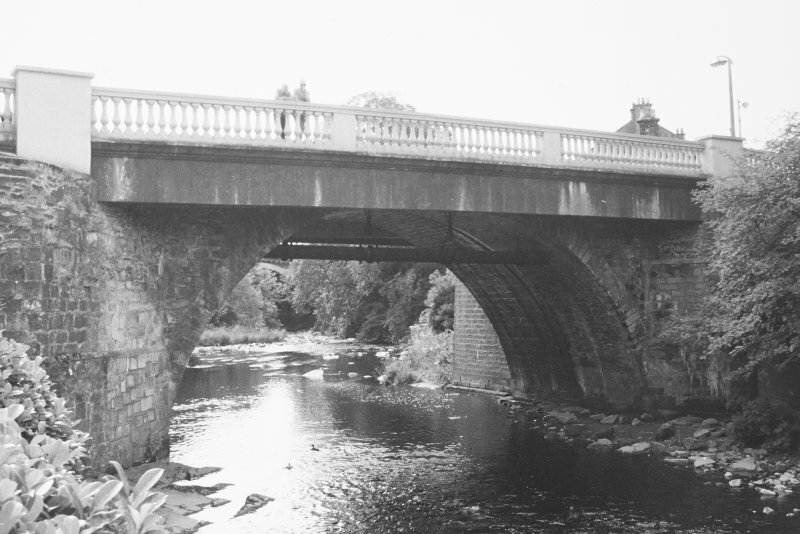 This ancient bridge links the High Street to Stirling Road and Bridgend. The original bridge was a single-arched bridge of yellow dressed stone, built by Bishop Finlay Dermoch in 1409, relics of which may be seen from the N. It was widened to the S in 1849, in red stone, and pavements were added by the girder bridge that was superimposed in 1927. Stirling Bridge (NS79SE 2.00) was luckier. This bridge carries Stirling Road (which here forms the B6064) over the Allan Water within the centre of Dunblane (NN70SE 68). It remains in use by local traffic. The bridge is depicted, but not noted, on the 1965 edition of the OS 1:2500 map. Information from RCAHMS (RJCM), 17 February 2006. One of the most important events in the history of Dunblane was the building of the bridge over the River Allan figure 8 in the early fifteenth century, on the instruction of Bishop Finlay Dermoch (1406-19). The original single arched bridge of yellow dressed stone was 12ft wide and approximately 42ft in length (3.6m x 12.9m) prior to its reconstruction in 1734. It is unclear whether the suburb of Bridgend was in existence before the building of this bridge, but this would prove to be a stimulus to settlement, being on an important routeway (seep 18). In 1849, the south end was widened with red stone. In 1927, a modern girder bridge with balustraded parapets was imposed on the original structure. Traces of the original structure can still be seen in the later fabric. The result of these works may have been to destroy all traces of the nether port, which stood on the bridge, probably at the east end. Information from ‘Historic Dunblane: The Archaeological Implications of Development’ (1997).